Every time I do a reading I am haunted by the blood of the poet. Haunted and driven right to the void by the blood of John Berryman. The blood of Hart Crane. The blood of d. a. levy. The blood of Vladimir Mayakovsky. The blood of David Lerner. The blood of Christopher Marlowe. The blood of Francois Villon. The blood of Alexander Pushkin. The blood of Yannis Ritsos. The blood of Eugen Jebeleanu. The blood of Orhan Pamuk. His novel SNOW is really a poem in disguise. Mouth and brain blood. The poem emptied out for the rope and the bullet. Dostoevsky puking blood all over himself while still dreaming of the Karamazovs the last day of his life. Charles Bukowski shitting his pants with blood while death comes to collect it in little bowls or with cupped hands, though his bones hold nothing. And, somehow Sylvia Plath is able to curl up in the fetal position inside that oven. She is not only gassing herself. She is baking her blood and her eyes as well. 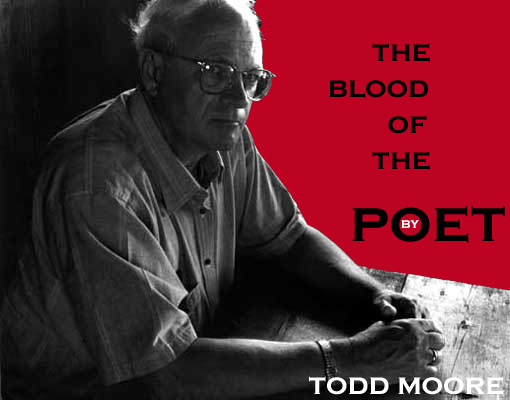 This entry was posted in Jared Smith, Todd Moore and tagged Jared Smith, Outlaw Poetry, Poetry, the blood of the poet, Todd Moore by Monsieur K.. Bookmark the permalink.